There are many ways to built a DIY PCB. Some of the more popular ones are the toner transfer method, and the UV exposure of PCBs. Both methods require lots of trial and error. Here is another way to go around building you PCBs. 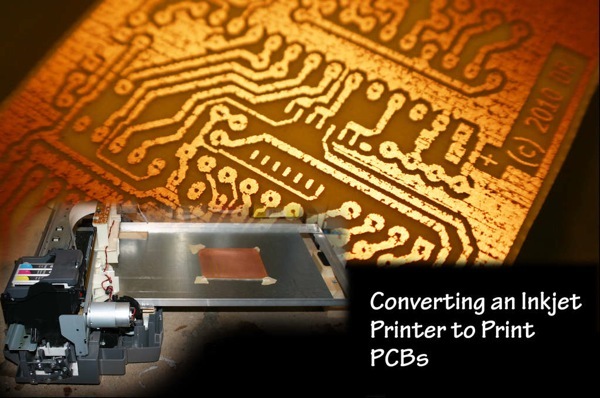 Pourcirup posted a tutorial on how to convert an old ink-jet printer to print traces onto a PCB. It is still being refined but the initial results look promising. This entry was posted on Friday, October 28th, 2011 at 10:00 am	and is filed under DIY, PCBs. You can follow any responses to this entry through the RSS 2.0 feed. You can skip to the end and leave a response. Pinging is currently not allowed. PS: Nevertheless a cool project!